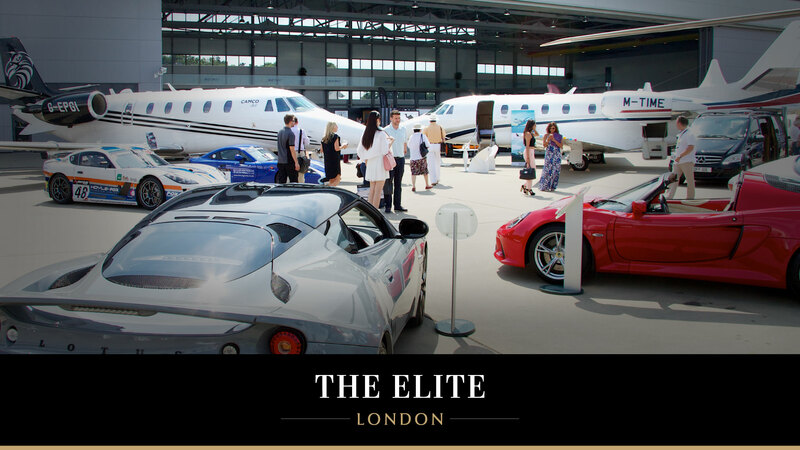 The Elite London is a unique lifestyle event that brings together the very best from the luxury marine, aviation and automotive industries in a two day showcase at London’s Biggin Hill Airport. 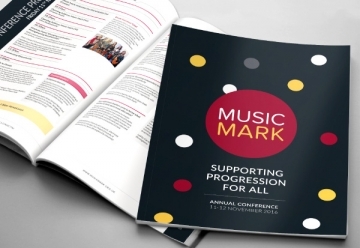 We were approached in the show’s first year to create all supporting print and digital materials including a website, email marketing templates, magazine adverts, brochures and event signage. 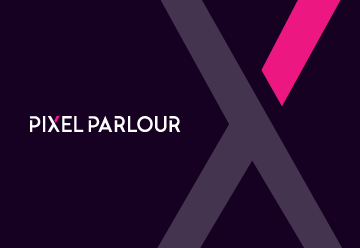 Now in its third year, our on-going role sees us continue to shape the design and development strategy for the event. Our first step was to establish the design principals upon which all our work would be based. 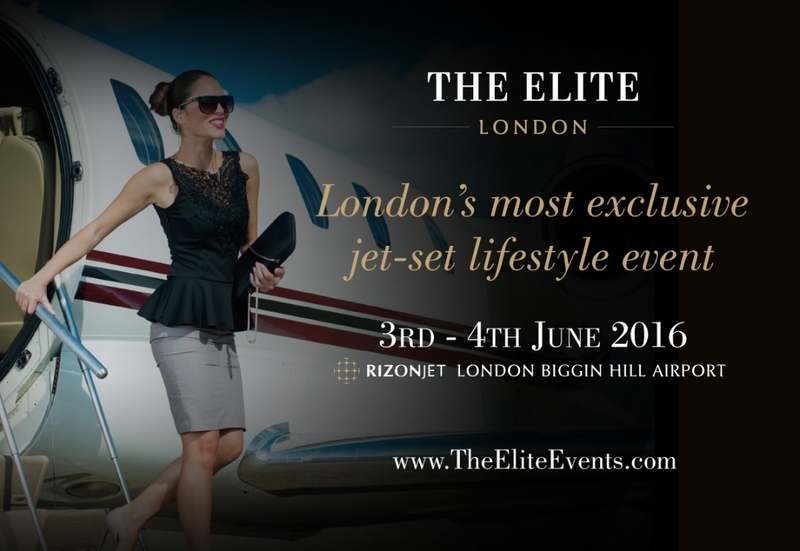 We set out to create a strong, consistent image for The Elite London, that would reflect and re-enforce the exclusive nature of the event. The colours, typography, imagery and voice all needed to evoke a premium feel and appeal to a target audience of HNWIs. When starting with an entirely blank canvas, drawing inspiration together into mood boards and then exploring possible style combinations through Style Tiles quickly helps us to narrow in on a winning formula. 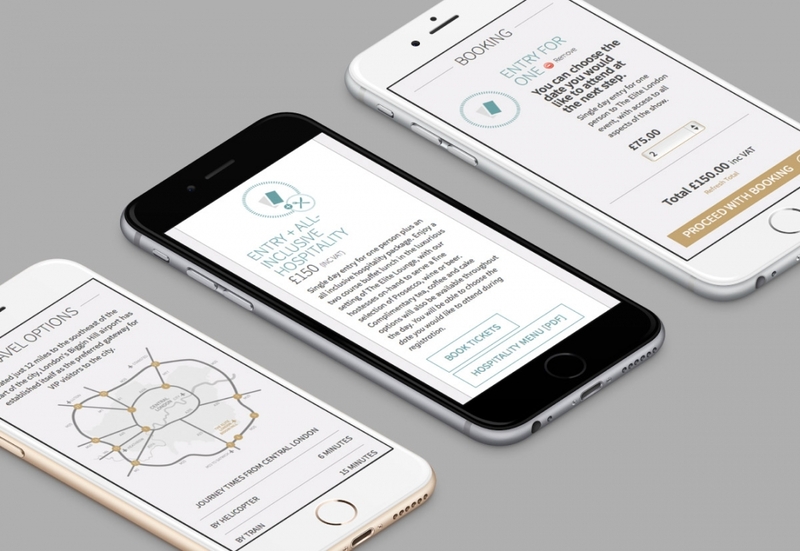 They are also a great way to involve everyone in setting the design direction and to start to think in terms of a consistent, Style Guide driven approach. As part of gathering inspiration we like to consider what design styles the target audience may be exposed to on a regular basis. We want what we create to feel naturally like part of their world, albeit with a unique twist to make it distinct and memorable. The Style Tiles put the ideas from our mood boards into context. 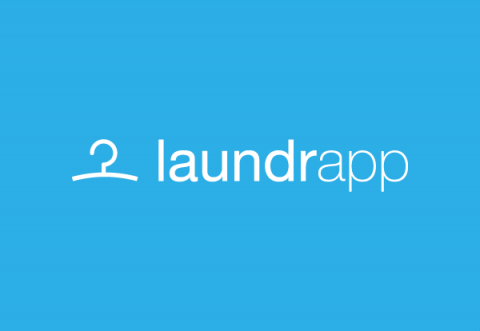 When developing different ideas for a brand we want to do more than just show a logo in isolation. By including accompanying images, copy and sample design elements we can create a fuller impression of how a particular approach will work in practice. Having established a direction that we were all confident with we set about creating a more defined set of design principles in the form of a Style Guide. 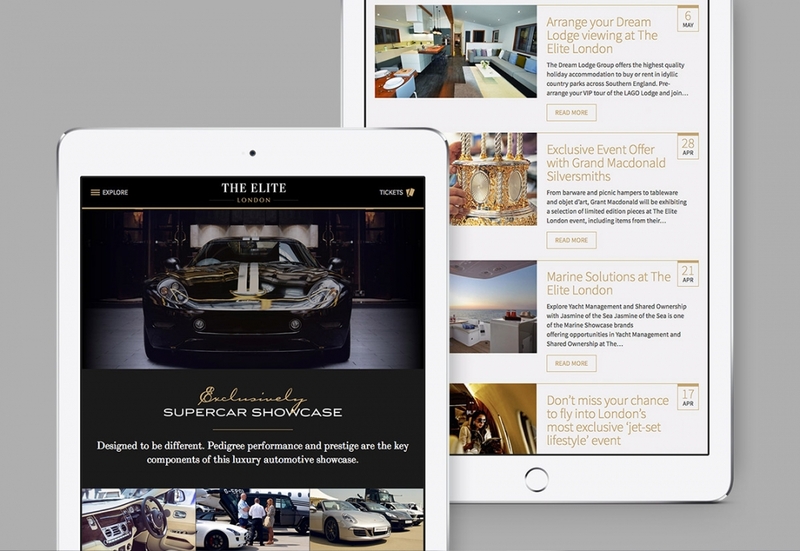 This resource would be a useful reference throughout the design process, ensuring consistency as we sought to apply the Elite London style across different media. 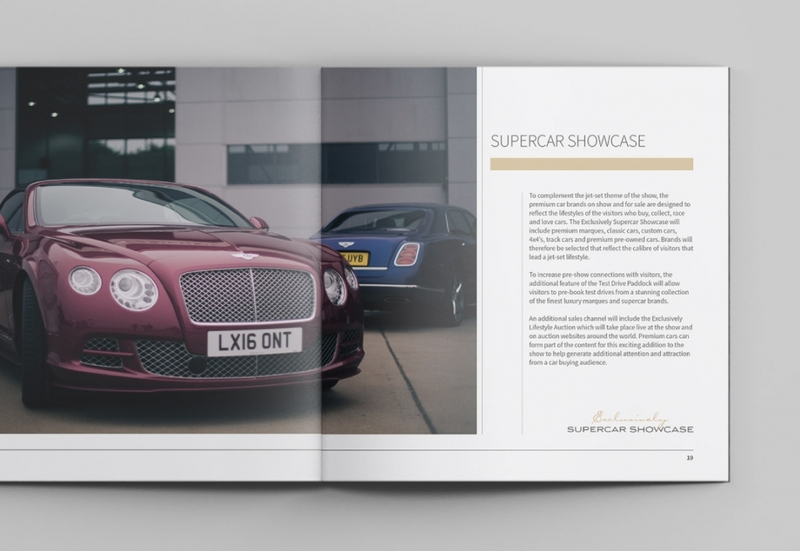 The website is a key component in the show’s marketing efforts, with brochures, magazine adverts and email marketing all referencing back to it. Prospective visitors can get detailed information about the event and its 150+ exhibitors, then go on to buy their tickets directly through the site. Companies can learn about the different exhibiting and sponsorship options available and after booking submit their company details to the exhibitor directory. 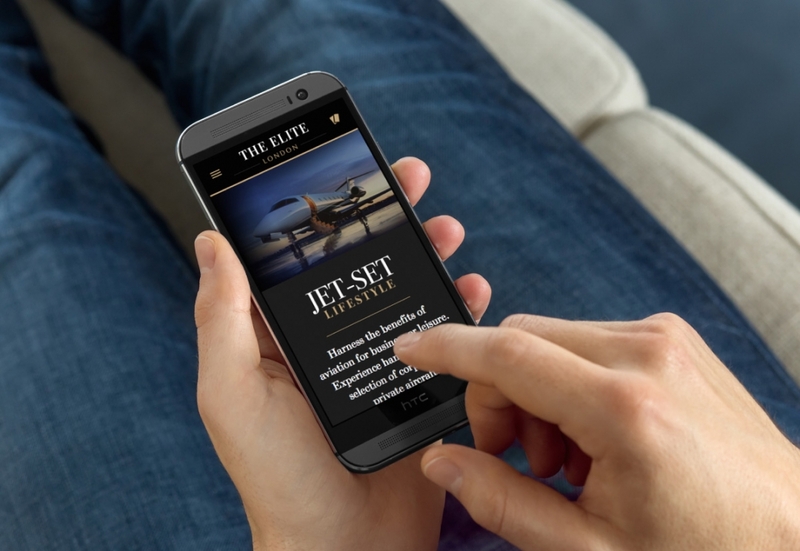 It was important for the Elite Events team to be able to manage as much of the day-to-day content updates as possible, with a low technical barrier to getting that work done. WordPress was a natural choice and twinned with our modular approach to development, content management is not only simple but also incredibly flexible. WordPress has a very rich ecosystem of high quality plugins for extending a site’s functionality. 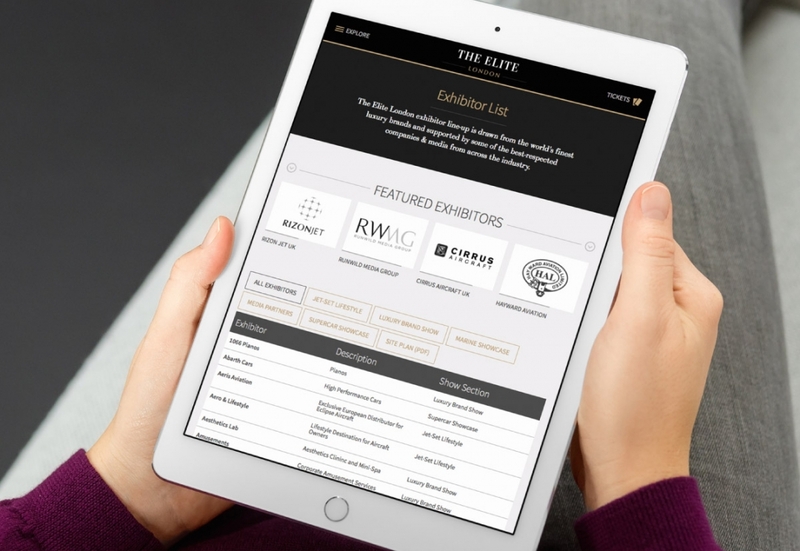 The visitor registration system is based on one such plugin, Event Espresso, which has proved a very reliable and flexible foundation upon which to create a customised booking experience tailored to The Elite London’s specific needs. 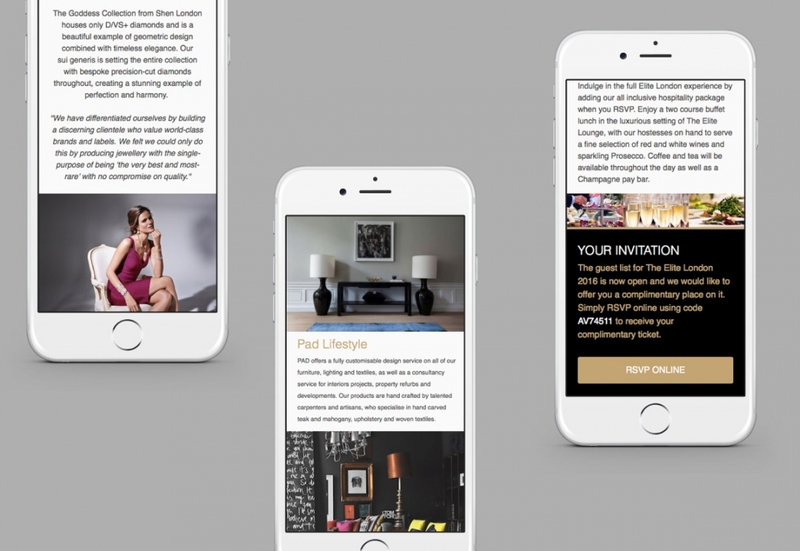 A carefully considered Responsive design ensures that all the site’s content and functionality are accessible across different device types, something that is particularly important for the spike in mobile traffic around the week of the event itself. Email has become the event’s most active marketing channel, driving predictable, regular traffic to the site that reliably converts into ticket sales. 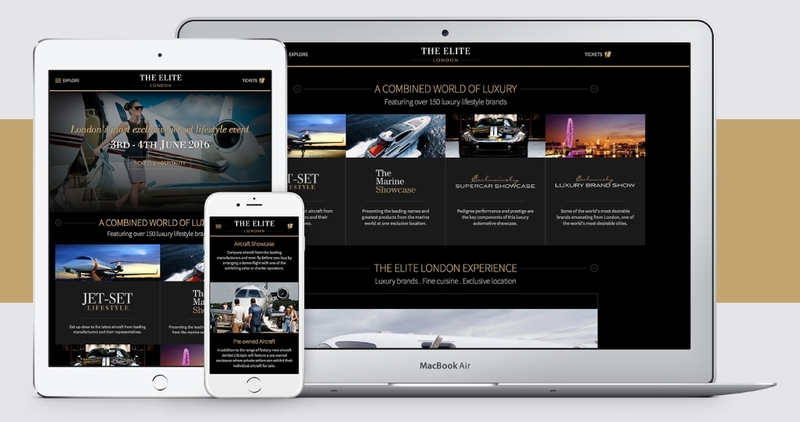 From initial setup to on-going campaign support and list management, we have helped The Elite London do more with this very cost-effective way to engage with their audience. The starting-point was a custom MailChimp template that their marketing team could use for day-to-day event updates along with a set of more focused emails for specific use-cases, milestone campaigns such as the launch of online ticketing or exhibitor line-up announcement. Email is an area that offers great scope for making data-driven decisions about design and content. 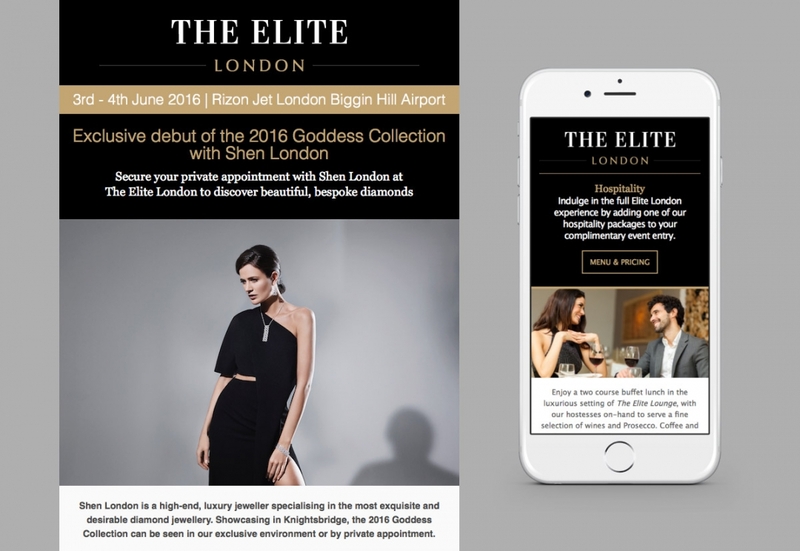 We have helped The Elite London take advantage of multivariate testing and conditional content and personalisation to maximise the response from every send and start building up a picture of their audience. From understanding what time of day and day of the week are best to send to what content types generate the best response. 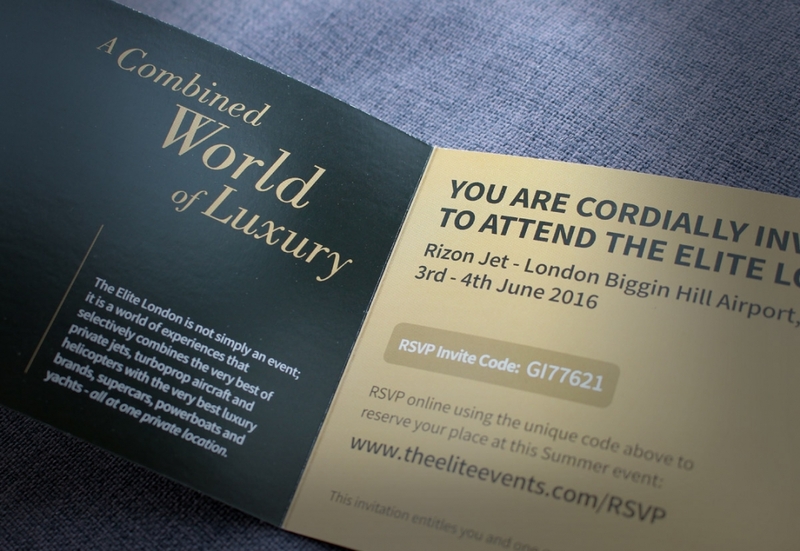 The Elite London required a range of supporting print materials from VIP invites to on-site signage. One of the first pieces of design – that would help set the tone for all print work – was the exhibitor brochure. 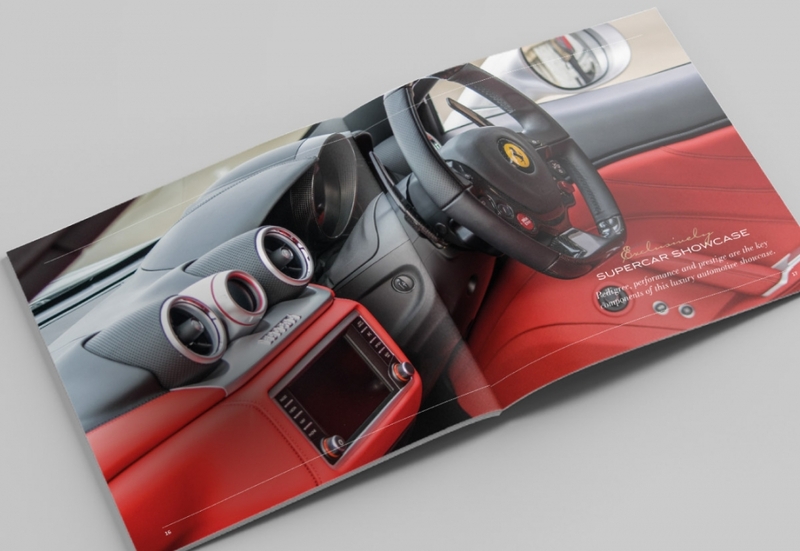 In contrast to a lot of print products, where the focus can be on packing as much information into as fewer pages as possible, here we had the opportunity to do things a bit differently. 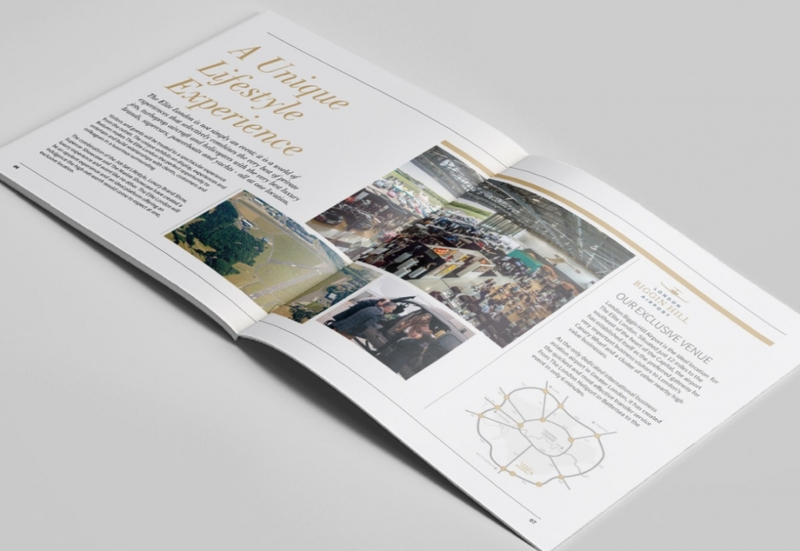 The way the brochures were to be used (as supporting material at meetings) allowed us to take a more image-led approach with clean, minimal typography and plenty of white space really allowing the content to breathe. Produced as a small run of high quality glass-backed prints, each with its own velvet-lined fitted suitcase, the brochure helped convey an instant impression of real substance and an essence of the show itself. 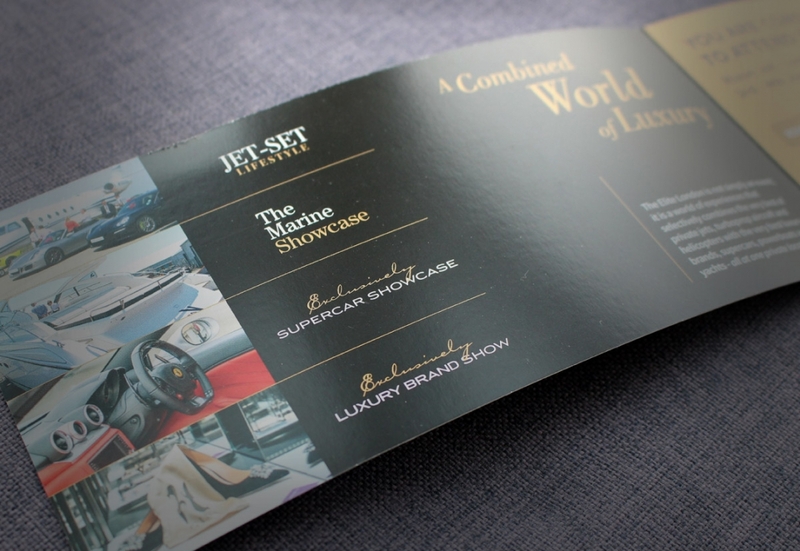 This premium finish extended to other print products, such as business cards, which benefit from foil-printed lettering and a heavy, textured paper stock. 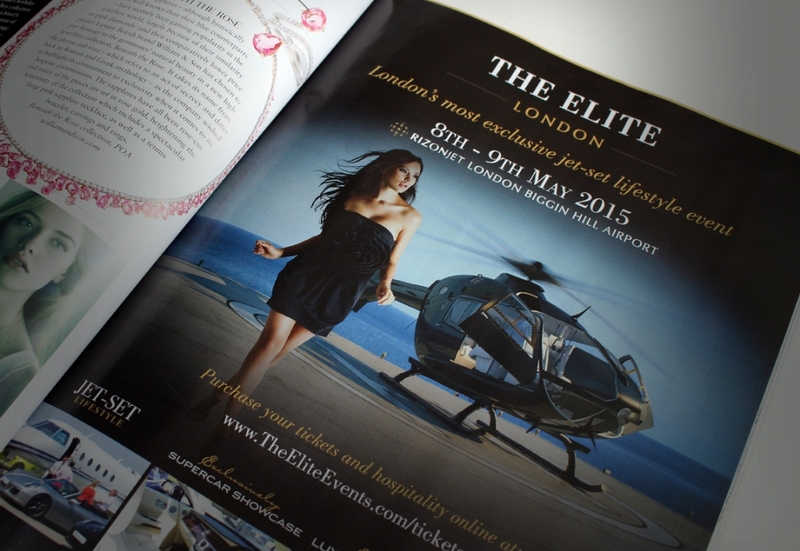 Magazine adverts run all year round, featuring in more than 20 publications. Devising a creative that could easily adapt for different formats we helped keep a consistent image and on-going production costs down. 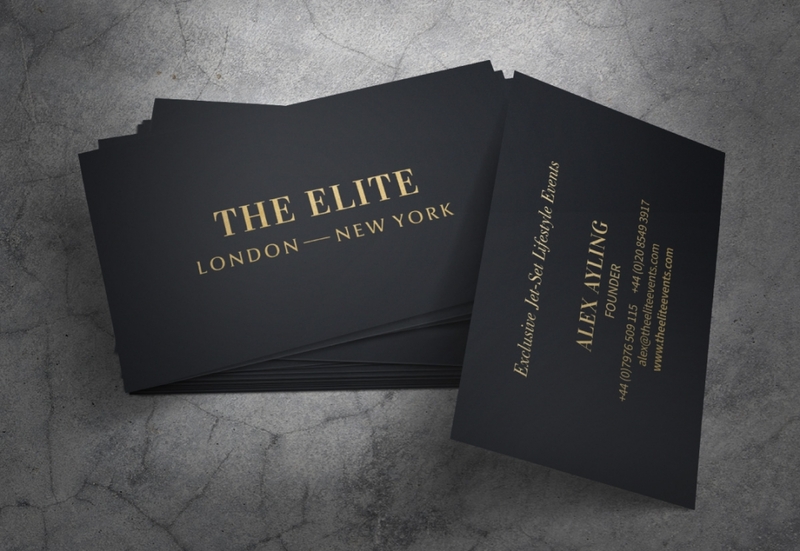 Again this is where the Style Guide cantered approach really comes into its own, providing the means to quickly and consistently apply The Elite London’s design language across different print products. 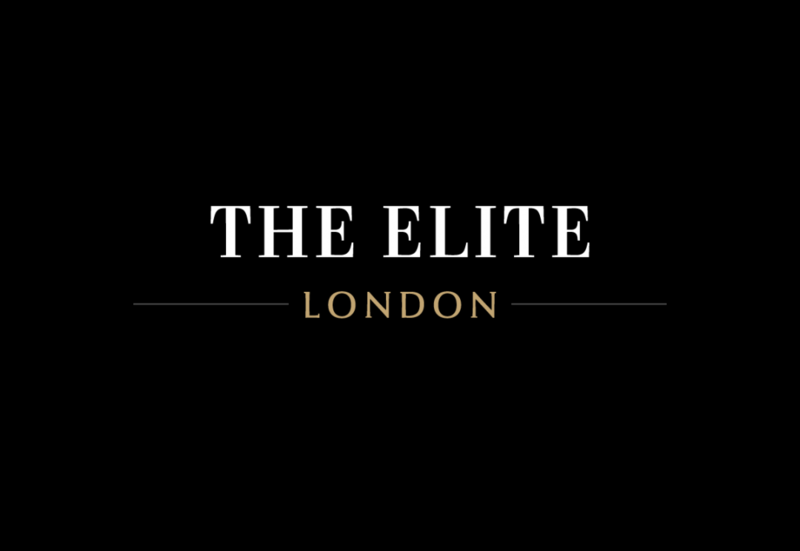 The Elite London continues to go from strength to strength and is set to expand to other international locations in 2017. Each year brings new opportunities to learn more about what works and make iterative improvements to the design, content and functionality. We continue to play a central role in shaping the on-going design and development strategy, pro-actively identifying, implementing and reporting back on performance.